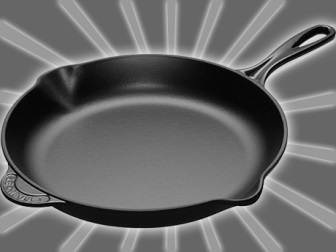 You might think of your frying pan as dedicated to cooking up bacon and burgers. If so, you’ve been severely underutilizing on of the most versatile tools in your kitchen. One skillet is all you need to make a delicious and healthy meal from start to finish. And better yet, cooking everything in one pan allows all of the flavors to mingle while simultaneously minimizing kitchen clutter and cleanup. Today we’re featuring one quick and healthy recipe, but the formula for dreaming up your own one-skillet meal is easy. Protein into pan, protein out of pan, veggies in, then protein back in, along with any sauce, broth, wine, or flavor enhancers. Simmer ten minutes then enjoy your meal. Peel garlic cloves and cut larger ones in half. Sprinkle chicken with 1/4 teaspoon salt and pepper. Whisk broth, mustard, flour and the remaining 1/4 teaspoon salt in a small bowl. Add the mixture to the pan; bring to a boil, then reduce the heat to maintain a lively simmer. Cover and cook until the chicken is cooked through, 8 to 10 minutes. Serve sprinkled with chives (or scallion greens). Better Man Monday: Save Your Shoes! Walk On was created with one goal - To provide our customers high quality socks with fun designs that don’t just match their shoes, but make their outfits.